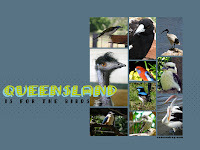 Vote Audrey: Freebie: Queensland Desktop Wallpaper 5 of ? Freebie: Queensland Desktop Wallpaper 5 of ? Here's number five in my desktop wallpaper series. I tried to use a variety of styles so that everyone could find one aesthetically pleasing. My apologies to anyone suffering ornithophobia.